This section is all about the physics that interplay with the the Spiral Wishing Well fund raising device and the Vortx toy. 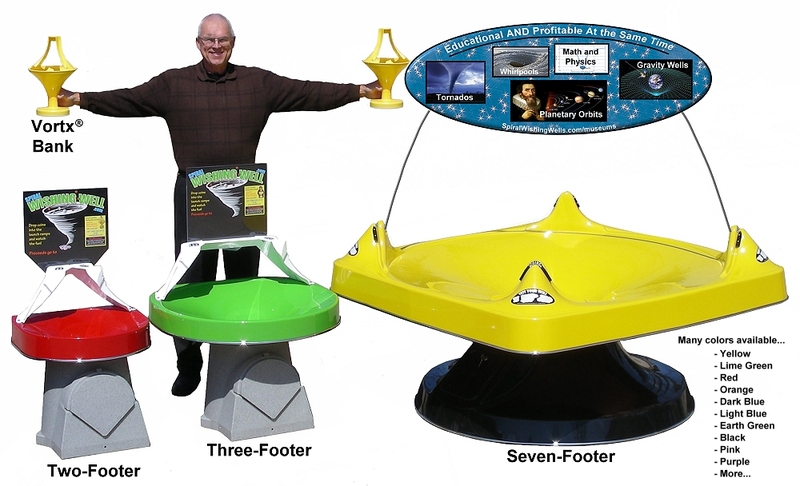 It answers the question, "How do the coins spin around the funnel and not fall over?" and a whole lot more. What is the source of power for the Vortx Toy? You don't have to plug it in. So where does it get its power? The initial power is supplied by you when you lift the coins into the air. When you let go of them, gravity takes over. 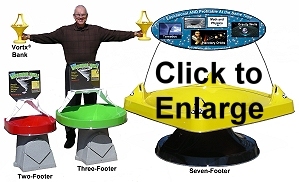 They slide down the ramp and shoot onto the funnel surface at a precise speed and angle. If they go too fast, they will run into the rim of the cone. If they go too slow, they will dive toward the center hole. It is the height and angle of the ramps which provides the correct angle and speed. Of course, this assumes there is no wind resistance which is never the case. All falling objects have wind resistance. 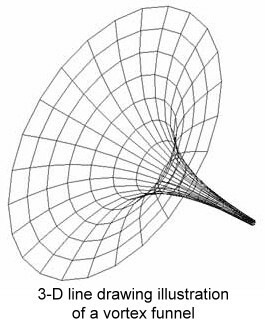 When the shape and friction of the object equals the 9.8 m/sec^2 gravitational pull, the object is said to have reached maximum or "terminal velocity". For instance, sky divers can speed up or slow down depending on their body, arm, and leg position. Gravity alone will not cause motion. By itself, it only holds objects tight against the earth. There must be some other source of energy that first moves objects away from the earth. Then, and only then, will gravity cause the object to move by drawing it back to the earth. You supply that energy when you lift the coin, and then drop it. The ramps launch the coins at exactly the correct angle and speed. But you can have a lot of fun with the Vortx® by removing the ramps and trying to throw coins onto the funnel surface at different angles and speeds. It can be difficult, but with practice, you can become very good at it. You will notice that it is easier if you can toss the coin in with some spinning rotation to help it have balance. This is similar to riding a bicycle. If you stop rolling down the street, you will fall over. Similarly, if the coin isn’t rotating, it will fall over. It is an amazing element of balance. A spinning coin effectively has a lower center of gravity than a non-spinning coin. This is true of any object. It creates a gyroscopic effect. As soon as the coins start to roll around the Vortx®, they begin to lose momentum. If you roll a coin across a table, it will roll until it loses momentum, then fall over. In the Vortx®, the coin tries to fall over, but because of the downhill shape, the coin does not fall down. Rather, it continuously takes a lower and lower path to keep from falling over. You do a similar thing when you walk. You lean forward, start to fall over, then put your foot out to catch your balance, and keep repeating that process with every step. If that sounds hard to believe, try walking without leaning forward first. Similarly, try leaning forward without stepping forward. But you better protect your nose!!! The coin on the funnel surface is doing something similar…almost falling over, but able to “catch its balance” by taking a lower path. Like water going down a drain, the forward momentum or inertia of the coin becomes centrifugal force which keeps the coin spinning as it descends the nearly vertical walls of the funnel. It actually is not gaining as much speed as it appears, but because the spirals are tighter, it looks like the coin is going a lot faster. What if you could ride a bicycle inside a giant Vortx®? Wouldn’t that be fun! It would work just like the coins, as long as you could peddle fast enough. A similar show is performed at fairs and carnivals with motorcycles being ridden inside a circular structure called a cycledrome or see-through ball sometimes referred to as "The Sphere of Death" because it is such a spectacular show. The rider's centrifugal force from their speed allows them to hug the walls even when they are upside down. For an object to move along a curved path a force must be applied to it. This force only changes the direction, not the speed of the object and is called a CENTRIPETAL FORCE. 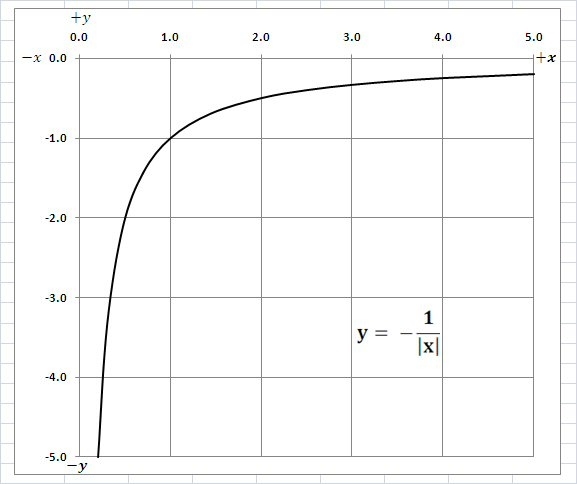 Note that the direction of the force (and hence the acceleration) is TOWARDS the center of the curve. Centripetal means "center seeking." Which Coins Roll Longest? Fastest? You can experiment with different coins to get different reactions. Which ones work best? Do the heavier quarters and nickels go faster than pennies and dimes? Does the smooth edge of a nickel and penny make a difference? Does the lower center of gravity (less top-heavy) dime have any advantage? Does wind resistance of the wider coins have an effect? You can learn the answers to these questions by making a straight launch ramp out of wood, plastic, or metal that launches coins onto a flat table. With the ramp at a constant angle, drop the different coins at the same point and measure how far they travel before they fall over. To conduct an accurate test, you will need to drop several pennies, several dimes, etc. so you can minimize the variables of nicks on the edges, lint, or dirty sticky coins. Insight #1: Here’s an insight that isn’t easily apparent: The heavier weight of a quarter and nickel cause them to build up a little more momentum (speed) out of the Vortx ramp. This is detrimental to a nickel which is not only heavy, but has a smooth edge. Therefore, it tends to “slide” down the ramp rather than developing a spinning (rolling) action created by the serrated edges of the quarter and dime. Because of this, in the Vortx toy, a nickel sometimes runs into the rim as it shoots off the ramp and has less balance since it is sliding more than spinning. Insight #2: The larger the coin, the greater its resistance against the side of the coin chute as it slides downward. Insight #3: The taller the coin, the higher the center of gravity (CG). Since a coin is trying to fall over as it rolls, it uses up some of its energy trying to balance upright. The higher the CG, the more energy is used just to stay upright. Also, as the coin descends into the more vertical portion of the funnel, that higher CG becomes even more of a factor. That combination of forces means that smaller coins will stay in rotation further down into the funnel. You can really have some fun with marbles, ball bearings, or a box full of BB’s dumped out onto the funnel. Balls have a lower CG and can't “fall over” so balance isn’t a factor and none of their energy is used to stay upright. Therefore, balls roll longer, they keep on rolling even when they bump into each other, and they roll a LOT farther down the vortex funnel. With the Vortx®, you can create your own centrifugal force by moving it in a circular motion causing the coin to climb back up the cone and go faster and faster around the inside of the rim. In fact, you can keep a coin rotating around the cone for as long as you have the coordination. The current world’s record is 33 hours and 16 minutes of continuous spinning of the same coin. The person that did that rested while the coin descended down the cone a couple of inches, then he made it climb back up, repeating the process over and over. Try spinning two coins at the same time. It is MUCH more difficult because they tend to knock each other over. By moving the Vortx, you are actually creating the centrifugal force that keeps the coin rolling, similar to the outward force an a car and driver at a race track. The lower you let the coin descend, the more challenging it is to make it climb again without letting it fall over. No matter what your skill level is, you can challenge yourself. Use it as an amplifier and megaphone! Take the Vortx® apart and hold the small end of the cone to your ear. Most people are amazed at how dramatically it amplifies the sounds. It seems to make the air snap, crackle, and pop. You can be thankful that your ears are not that big. Not only would you look funny, but the noise would drive you crazy. This can explain how some animals can hear so much better than humans. Try an experiment to illustrate this point. Turn a radio or television on with the volume so low you can barely hear it. Now move away from it until you can’t hear it at all. Now put the Vortx® cone to your ear and be amazed! Putting the cone to your mouth is equally dramatic. Its perfect bell-shape turns it into a megaphone. It is the same shape as the end of most musical wind instruments and loudspeakers at sports stadiums. Now when your parents need to call you in from outdoors, they can borrow your megaphone. An object continues to do whatever it is doing. If it is rotating, it continues to rotate. If it is at rest, it remains at rest (unless acted on by a torque of some kind). We call this quality of matter ROTATIONAL INERTIA....also called Moment of Inertia. 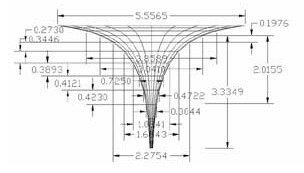 What is the mathematical formula of a perfect vortex funnel shape? a comprehensive book about gravity wells. Click here to read Mirenberg's An Introduction to Gravity-Well Models of Celestial Objects. It contains pictures, graphs, and other scientific information for the more advanced reader. This is a large file. If it doesn't open in your browser, please contact us for a copy.